If one picture is worth a thousand words, this picture comparison is worth one million! 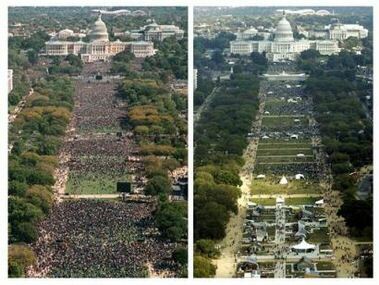 The photo on the left is from the Million Man March of 1995. The photo on the right is from yesterday. Obviously people are not as interested in Farrakhan any more! Having attended the 1995 march (or I guess you could say “stand”) myself, I think I know why some people did not return this time. Simply put, we know we can work to help people without the aid of a racist. Not to mention, the first march was built on principles that involved Blacks doing for themselves. While this latest march was mostly a Bash-Bush fest! With invented claims about a bombing in New Orleans, used to try and drum up support. What a difference a decade makes! Also, Gateway Pundit has additional coverage that you won’t hear in the MSM (main stream media). OK Farra-The-Con, time for you to step aside! I think this event should be remembered as More Pimps, Less People 😀 . Punditguy offers analysis of the sad direction this went in. Daimnation offers a look into the background of some of the speakers in attendance. Discriminations offers a look into some who complained about not being invited, along with interesting commentary. Right Wing News has some hilarious commentary about a truly insane interview with the man behind all this! update (10/18/2005 12:53PM ET): This post listed in The Political Teen’s list for Open Trackback Tuesday. He has some great video of some of the nuts on his blog. I too recall my great pride in attending the original event and seeing a “sea of Brothers” with a purpose. When I heard that Jesse Jackson and Al Sharpton would take a key role in the event this time I knew for sure that I was not going. Anything that they are invovled with will ultimately be for the benefit of the Democrats first and Blacks second as they sell us on their view that “what is good for the Democrats is good for Black folks’. I would like to know if these two support the establishment of an independent political party? They support anything that makes them money. And the idea of a Black political party was floated during yesterday’s nut fest. I want what every American wants, so I don’t need a party based on race to represent me. No more than I need any other party. I’m Independent because I don’t want to be “in” with any of them! I would never again attend given Farrakhan, Jesse and Al were involved. I will do nothing with any of them. I’ve had no problem teaming up with lesser pimps like Derrick Boazman and Timothy McDonald when they protested “The Players Ball” at an Atlanta club. Given this whole “playa” facet of Black culture promotes very negative activity. I agree with them on that and we protested together into the night and went our separate ways afterwards. If the pimp’s effort is on point I might support the effort without supporting the pimp. But some pimps like Farrakhan, Jesse and Al are just too much of a set of opportunists for me. And Farrakhan is a total racist! Also Farrakhan is a friend of many who support terrorists. Be sure to read some of the links in my post. Even at yesterday’s event he was speaking positively of some of Earth’s most evil men. « Justice Clarence Thomas a issues temporary stay that may just save a life!